Our TEQSA accredited MBA+ is one of Australia’s quality Master’s degrees backed by AIM’s 75-year heritage. As well as being highly flexible to fit around your life, the MBA+ gives you five years of exclusive benefits that deliver more, long after you graduate. Get more from your career with an MBA that goes the extra mile. Learn without limits. AIM’s game-changing MBA+ will equip you to excel in today’s evolving landscape. The program combines AIM’s accredited MBA with the MBA+ Gold Card, which gives you five years of complimentary access to AIM short courses, as well as several other exclusive benefits. 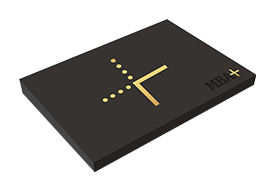 Discover the MBA+ today. Our coaches map your study plan, review resumes and recommend short courses and goals to make the most of your masters and maximise your success beyond your degree. Build on your master’s degree with specialised skills development on-campus or online designed to enhance your professional growth. Australia-wide access opens you up to workspaces where 20,000 professionals come together to work, network and collaborate each year. about how AIM's MBA+ can help your career outcomes. 1 QS Jobs Salary Report, 2017. Based on average exchange rate in 2017. 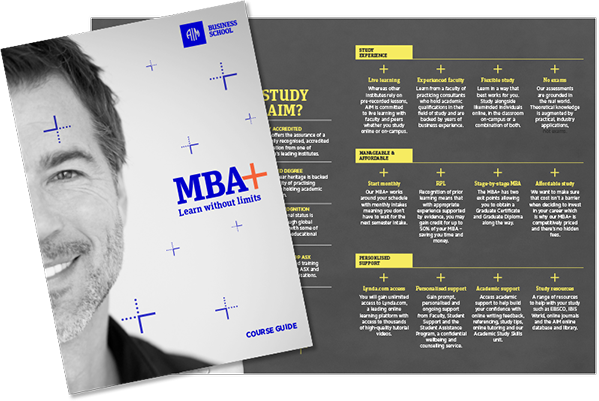 2 AIM Business School Graduate Survey 2016. Graduate with one of Australia’s quality master’s degrees. Get more from your career with a degree that goes the extra mile. Learn without limits. Study online, in the classroom on-campus or a combination of both. AIM is committed to live learning with faculty and peers whether you study online or on-campus. Learn from a faculty of practicing consultants who hold postgraduate academic qualifications in their field of study and are backed by years of business experience. With as little as 5 years’ management experience and no degree, you could embark on your MBA by starting at the Graduate Certificate level. With appropriate postgraduate qualifications and/or experience supported by evidence, you may gain credit for up to 50% of your MBA – saving you time and money. Depending on your eligibility, enter directly into the MBA+ or study stage-by-stage. We want to make sure cost isn’t a barrier when deciding to invest in your career which is why our MBA+ is competitively priced and there are no hidden fees. Plus, FEE-HELP is available. You will gain unlimited access to Lynda.com, a leading online learning platform with access to thousands of high-quality tutorial videos. Gain prompt, personalised and ongoing support from Faculty, Student Support and the Student Assistance Program, a confidential wellbeing and counselling service. Access academic support to help build your confidence with online writing feedback, referencing, study tips, online tutoring and our free Academic Study Skills unit. A range of resources to help with your study such as EBSCO, IBIS World, online journals and the AIM online database and library. MBA+ offers the assurance of a nationally recognised, TEQSA accredited qualification from one of Australia’s leading institutes. AIM has been delivering the MBA for over a decade with a 75-year heritage backed by a faculty of practising consultants holding higher academic qualifications. We are current members of Principles for Responsible Management Education (PRME), a United Nations-supported initiative. AIM is the preferred training provider to leading ASX and public sector organisations. With flexibility built in at every stage, and depending on your eligibility, you can enter directly into the MBA+ or study the MBA+ stage-by-stage. By completing the Graduate Certificate in Management, you’ll be one step closer to a Master of Business Administration. Designed with senior managers in mind, the Graduate Diploma in Management is an ideal mid-level postgraduate qualification. The AIM Business School MBA will provide you with the broad business acumen you require to excel in your career. Study one unit at a time and pay per unit. Choose from a range of 12 elective units such as Mindfulness. Progress towards the MBA+ and gain qualifications along the way. Fast-pace your study or progress at your own pace.